Let's face it - homemade bread rocks. The problem with making it is that it takes time (which no one has) so we buy inferior packaged bread. And, this packaged bread, has stuff in it like dough stabilizers and high fructose corn syrup. What if you could make your own bread in FIVE minutes a day? "Healthy Bread in Five Minutes A Day", by Jeff Hertzberg, MD and Zoe Francois, is your book if you are interested in such an enterprise. It is a Amazon bestseller in the baking section because the book makes the process really easy to understand. This photo is of bread that my husband, Matt, baked himself. Doesn't it look amazing? You make a starter mix for many loaves of bread in a big container, let it rise, and just leave it until you want to bake. You pull out a pound of dough, let it rise, and bake it. And, you can make it MUCH healthier than any packaged bread from the supermarket. The big nutrition problem with bread is that the processing of the flour removes the nutrients. Hmm, homemade bread is amazing, especially when it doesn't take too long AND is healthy. Love it. May check this book out and look into this more. Thanks! Oh, cool! I've been using this method for about a year now, and I love it! 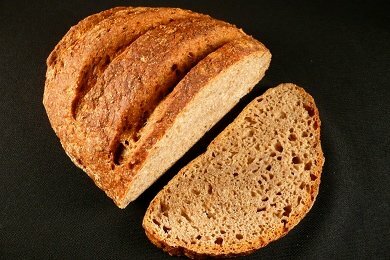 It does make some fantastic bread, and you can use all whole-grain flour and still get a delicious product. The slow rise really makes a difference. Ooooo.... I'm going to have to check that out. I have a bread machine and we make bread and pizza dough about once a week. The kids don't always like the bread I make, but the pizza dough is a huge hit that they like better than purchased dough. Does anyone have a good recipe (not from the book) that they can share? I have been making the no knead Jim Lahey bread that Mark Bittman wrote about in the NY Times (http://www.nytimes.com/2006/11/08/dining/08mini.html) and it's pretty good. The cookbook is called "My Bread." Anyone tried bread from both books? How do they compare? I purchased Dr. Hertzberg's first book....Artisan Bread in Five Minutes a Day and it is AWESOME! Love making break and it is so quick! That picture of the bread your husband made, looks amazing! Seems like a great idea. We have the book because it has a chapter on gluten free breads. They are wonderful!!! And easy. Ironically enough I was JUST about to google making bread dough ahead of time. For the past month, aside from potty training my toddler, I've also been making bread every other day. But it's taking so long to bake in the mornings, that I end up having brunch rather than breakfast and lunch! YEAH! I had sort of 'forgot' about doing this and loved it when I used to make my 5-min bread. Now I'm committed to making most if not all our families bread and even homemade ENGLISH MUFFINS-yum!! I found, through the links above, where to buy those little round english muffin 'makers' on the King Arthur Flour site. Maybe you can get a post dedicated to healthy english muffin breakfast recipes? ;) :) THANK YOU, you rock. Also, bought this book finally (I had originally just borrowed someones book). where I found a set of 8 rings, with good reviews. Just trying to save another mom a few dollars :). Hope this is useful for someone! I've been making no-knead bread from the King Arthur site for a couple of years now, basically a 5-min artisan bread recipe; 1 batch for 4 small loaves, or 2 regular-sized loaves. I experiment with toppings and add-ins from olives, carmelized onions, to raisins, nuts etc. so easy n yummy! King Arthur rocks! Pretty much the only thing in homemade banana nut bread that is not particularly good for you is the sugar, and this can be offset by using natural cane sugar or even a sugar alternative such as honey or agave nectar. As long as it is homemade or baked by a trustworthy baker, banana bread can be considered a healthy and delicious snack, provided you do not smother it in a ton of butter.